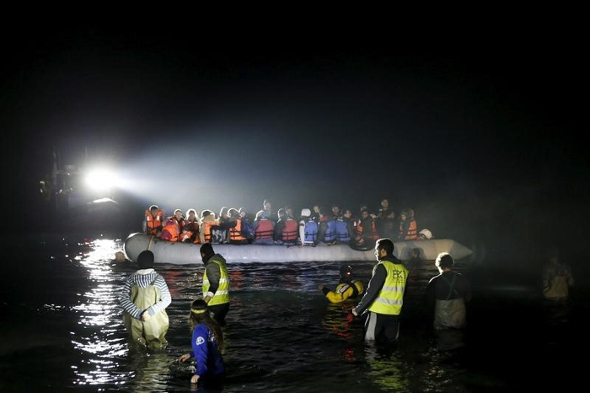 A rescue boat (L) shines a light on a dinghy carrying refugees and migrants as it approaches the shore near the city of Mytilene on the Greek island of Lesbos, March 20, 2016. The reality of civil war and migration rips identity apart while exposing new hope in humanity, writes Danny Ryan Youssef in part two of this three part blog series. Part one was published last week. I took comfort in my family and started to get involved in their conversations about Syria. I started to feel my mother’s pain much more when she described events happening in her old home. I discovered what my father was doing to help the children and the school in his old village, something I previously had no idea about. 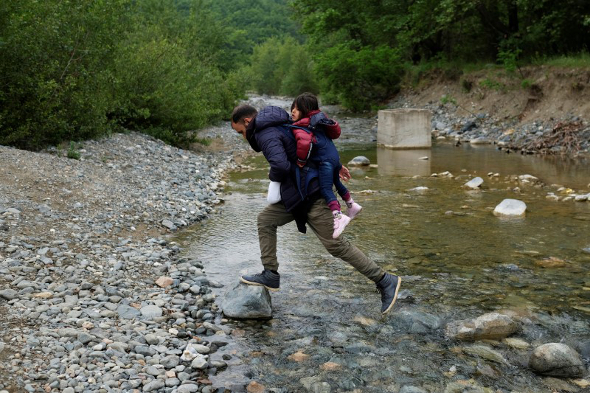 A man carrying a child who tried to cross the Greek-Macedonian border crosses a small river on their way back to a makeshift camp for refugees and migrants at the border near the village of Idomeni, Greece, May 12, 2016. Nevertheless, I couldn’t help this sensation of hollowness. I couldn’t shake the feeling that I wanted to be more directly involved in the aid of the refugees, the good people that I had met in Keleti, Budapest. Then I found out about the Calais refugee camp on the UK’s doorstep. I got in contact with a lady who was devoting her time to keeping the people of the camp going. She gave me the details I needed to get down to there and provided a list of all the things they required. I packed the food, clothes and blankets into car on the Saturday morning, drove down to Dover and onwards to Calais. The entrance to the camp was underneath a motorway bridge. As I approached I started to get scared, I was completely alone in the car and the people around me weren’t the vulnerable families from Syria that I had met in Keleti. The majority appeared to be grown men of east African origin. As I got closer, the number of people on the streets grew until my car was completely surrounded. By the time I got to the motorway bridge I felt trapped and frightened, so much so that I couldn’t bring myself to get out of the car. 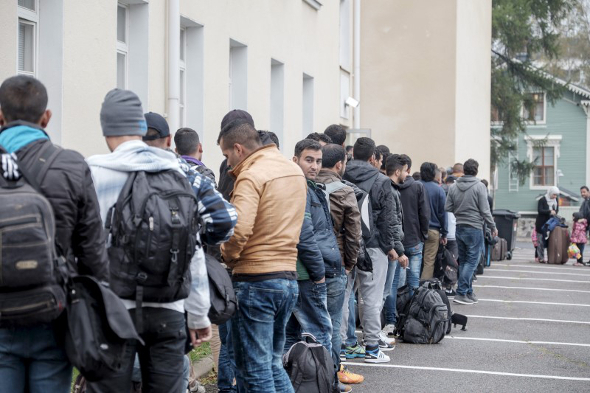 Asylum seekers arrive at a refugee reception centre in the northern town of Tornio, Finland September 25, 2015. I called my contact at the camp and she sought to reassure me. She told me not to worry, just park the car and walk straight in, they would be waiting and nothing would happen to me or the vehicle. She told me the people in the ‘Jungle’ were good people and that I had no cause for concern. I cautiously obeyed, getting out and locking the door, no one batted an eyelid. I walked into the camp, past the motorway bridge and scores of refugees without incident. In fact, the only acknowledgment I received was a brief smile from one of the few children around. I started to feel ashamed, I wasn’t sure if it was some subconscious racism that had made me feel the way I had or some other ingrained fear of different people and places. The ‘Jungle’ was very different from Keleti, much more akin to what one would consider a stereotypical refugee camp. A sea of tents, people milling around seemingly aimlessly, a couple of filthy toilet stalls and two water taps with long queues next to them. There I met the lady I had been in contact with and began to plan distribution of my donations. The refugees were good people and knew to queue, the difficulty was maintaining order when donations first started to get handed out. As soon as a car boot opened there would be a rush of people literally running towards you. This was quite intimidating at first, however I eventually noticed that as long as we were calm they would be calm. The men always let the women and children go first, they never asked for anything more than what they received, always said thank you, and if the donations ran out no one would complain. Having accustomed myself to the diverse and sprawling community of the ‘Jungle’ I began to meet its residents. There were a lot of Eritreans and Somalians who all spoke Arabic, so once again I ended up in a relatively unique situation. 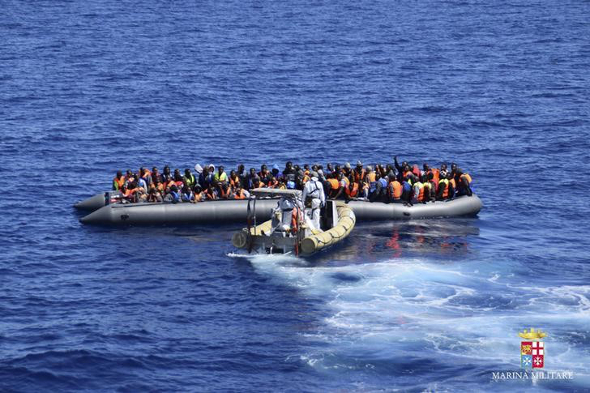 Migrants sit in their boat during a rescue operation by Italian Navy vessels off the coast of Sicily in this April 11, 2016 handout picture provided by Italy's Marina Militare. I was invited to dinner with a group of Somali men in their little corner next to the church (yes they built a church, they also built a café, restaurant and shop). I sat with this group of 15 or so Somali men who cooked me a delicious stew and a type of doughy side dish they made by ferociously beating flour in boiling water and salt. The ingenuity in the camp was astonishing; their cooking utensils were half a pot, a metal plate and a fire. The cooking wasn’t the most impressive thing however: they all took delight in showing me their individual sleeping arrangements, inviting me into what looked like little hotel rooms albeit made of corrugated steel and wood. During this meal the Somali men told me many stories, some truly ghastly, some awe inspiring, some about death, the closeness they felt to their friends and their journeys from the waters of the Mediterranean to the deserts of the Sahara. They simply couldn’t believe a country as great, in their eyes, as the UK could leave people to scrounge for life the way they were. I didn’t know what to say, I had to be honest and say the doors are probably never going to open and that they are better off seeking asylum in France, a comment they appeared to have heard before. Part one of this three part blog series was published last week. Part three will be published next week.